So who is going to the October C&C? Two weeks left. Gonna be a good one, too. Cause I'll actually be in attendance? Lol. 15% Llumar tint, SSV Series Badges. Tuned by Kevin (vv8) with HP Tuners. Guess I won't be there...I just got in a wreck, tonight. He'll be there. Don't let him fool you. Lol. Orange square everyone. be there early as this weekend's weather looks to be great and therefor it will get packed quickly. I was actually be in attendance this time. Looking forward to meeting everyone. Dec. 4th... the event is back! They're announcing the location tomorrow, so I'll post it when I find out. See some of yall there. New event location is the Marq*E Center at Silber and I-10. I figure we try the Orange area, as spot #1. If not, White area as spot #2. Those spots would be best for watching cars on the freeway, and exiting. I'm not sure if the white area is even going to be available, but it'll be nice to try and be on that side near the feeder road. Blue area would be spot #3. Then, Red or Yellow as the last spots. I'm going to be there around 7:30, if not earlier. If anyone wants to meet up, PM cell numbers to make it easier. If not, just drive around 'til you see a Herd of Goats, or the guy with the GasTiresOil shirt on. See yall in the morning!!! Should be a nice turnout! Sure was a good turn out. 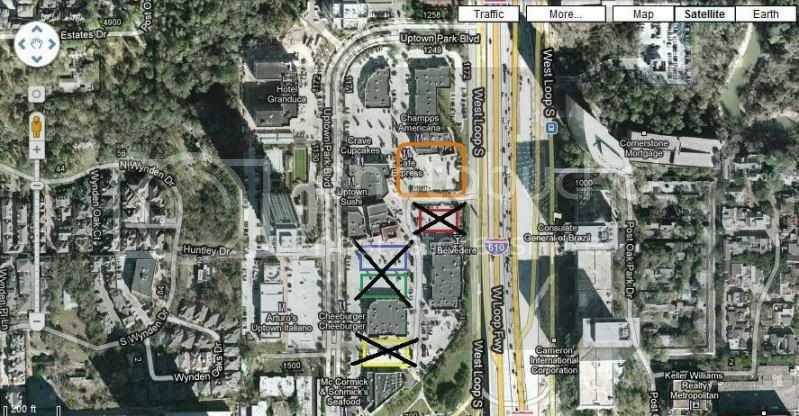 Just a reminder: C&C is this Saturday at the Marq*E. Some of us are meeting at the Home Depot on 290 @ Fairbanks. We'll be there a lil before 7am, and taking off about 7:10am. Once again... we're trying to park in the Orange area. It's that time again, Houston! Cars & Coffee is now @ Vintage Park on 249N & Louetta. I'm going to chill behind the Texas Land & Cattle Steak House on 1960/249, before taking off to Vintage Park. I'll be there around 7:00 AM. Red Arrow shows the 249N direction. The orange square is where we're meeting, again. If you're going North on 249, exit FM1960, and make a U-turn under the freeway. You're going to turn into the first driveway, and drive behind the restaurant. We'll all try and meet there around the same time. Last time, we took off close to 7:40, and we had to park a lil bit towards the back. This time... we're taking off at 7:30! 10 minutes isn't much... but it should help a bit. This was the general area we aimed for, last time. We parked a bit further out, but we stuck together. If you're one of the first ones there, try and find an open area to park. That way whenever the rest of the Herd shows up, we can continue to park in a group. If you decide to show up late, just look for us around this area. Hope to see some of you guys out there. People are still talking about that damn TR GTO on Houston C&C's Facebook page. Let's go out there, and show them that the HGH knows how to keep it civilized. Trying to see who all is meeting up.